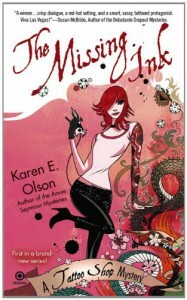 I really enjoyed this book and look forward to Pretty in Ink, but. . . I found the connections between all the characters and the convergence of events that led to murder a bit too convenient and therefore leaning towards unbelievable. The conclusion felt muddled and at least one question in my mind remains either unanswered or unclear. I caught the tiniest whiff of a possible future love triangle, a concept I hate and could rage about for days, because there is no other explanation for a particular character's second appearance. Having said all of that. . . I enjoyed all of the characters, the good, the crazy, the questionable, and the uncouth. I enjoyed the setting - this written Vegas rips away the shiny bright facade. The red herrings were well done and the mystery kept me puzzled even when the culprit became clear. I thought the burgeoning, bumbling, heady attraction was well written, as was the book as a whole. I loved the tattoo artists removed from the seedy stereotype often portrayed in television and movies; the art historian in me approves. I'm happy I found a cozy that avoided all the usual clichés of the subgenre, I'm keeping my fingers crossed about that triangle.